Columbus resident Sherri Sims stands in front of her former dream home. Sherri Sims knew exactly what she wanted in her new home. “Two-story, 3 full bedrooms, 3 full baths," Sims says. "There was a garage that was kind of standing up." The northeast Columbus home was supposed to be built from cargo shipping containers. But Sims' dream didn't turn out the way she planned. After construction delays and design issues, the unfinished Bassett Avenue home waits for work to start up again. The house would be the first of its kind in Columbus built from shipping containers, the metal cargo boxes usually hauled on ships and semi-trucks. Several containers used in the structure are covered with plywood on the exterior, and windows look out on all sides. Plans called for the house to be surrounded by several other shipping container homes, but none of those are even off the ground. “There was always a lot of discrepancies as to why things weren’t getting done," Sims says. Sims says after a delayed groundbreaking, construction began in the spring of 2018. The non-profit agency Nothing Into Something Real Estate, Inc. started the project. In 2016, WOSU spoke with the agency’s president and CEO Michele Reynolds, who said using shipping containers as the bones would make it 50 to 60 percent cheaper than building with traditional materials. She also boasted that this would be a creative way to solve Central Ohio's affordable housing problem. Reynolds hired contractor Chelsi Technologies to do the work. But Sims says the company seemed to be floundering on her home. Sims says she looked forward to buying her home for $105,000. After the delays, though, she expected the price would go up. 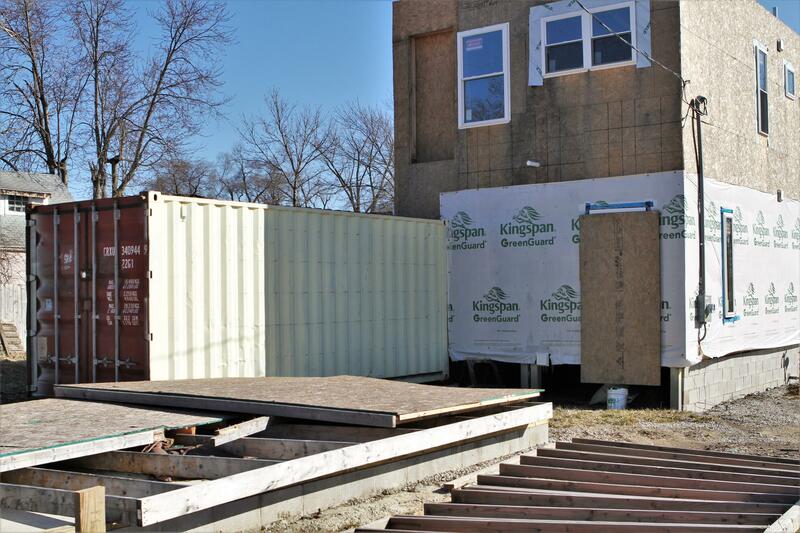 Cargo shipping containers make up the bones of this incomplete apartment in Columbus. In mid-February, Sims says she received a full refund of her $500 deposit, plus an additional $500. WOSU contacted Reynolds by phone for comment. Barry Cummings, head of Chelsi Technologies, originally agreed to an interview but later opted to email a statement. “It is unfortunate that all parties involved were not able to complete the project for various reasons that were beyond our control,” Cummings wrote. The City of Columbus’ Department of Building and Zoning Services does not list any complaints filed against Chelsi Technologies. Assistant director Anthony Celebrezze says his department issued the contractor a building permit in January 2018, as well as other trade permits like electrical, plumbing and mechanical. Then at the end of 2018, Celebrezze says inspections halted. “We had a meeting back in September over some of the structural components because they weren’t matching up with, A. The plans that were approved, and B. The Ohio Building Code, which is what we adhere to ensure a structure is designed and built safely," Celebrezze says. Celebrezze says building with shipping containers brings new hurdles since it’s a relatively new type of construction. “As we continue to move forward to address the challenges with the code as it exists, then we will have a new method, potentially less expensive, quicker method to building a single family or a multi-unit structure," Celebrezze says. Around the corner from the partially completed house, construction on the cargominiums on Old Leonard Avenue also has stopped. Work crews connected the 54 old shipping containers for 25 apartments, but exterior and interior work remains. Nothing Into Something Real Estate has hired new construction firms. One of them told WOSU that Reynolds did not want the firm to make any comment. Sims just hopes no other homebuyers are disappointed. “I’m just mad, and I want to get the word out so this doesn’t happen to anyone else," Sims says. A new arts space in Columbus’ King-Lincoln District will transform shipping containers into unique showcases for local artists throughout the summer. This is the first of a two-part series on affordable housing in Columbus. Read part two here. Mattias Minarsch leads a group of about half a dozen Habitat For Humanity volunteers putting the finishing touches on a home in Linden.